Tried to make smooth animation. Here is a result. There are still things that should be improved, but for the first time I think the result is quite good. There seems to be lots of animation artifacts, eg studs moving slightly by the feet when they walk, and the arm rest of the sofa appears to move when he puts the plate on it. even with the minor flaws I think it's fantastic! it must have taken you ages! Very cool! How long did that take? Hi, I'm new here ! I'm making the videos in stop motion, but it's some kind of set review with interesting minigigs animation. 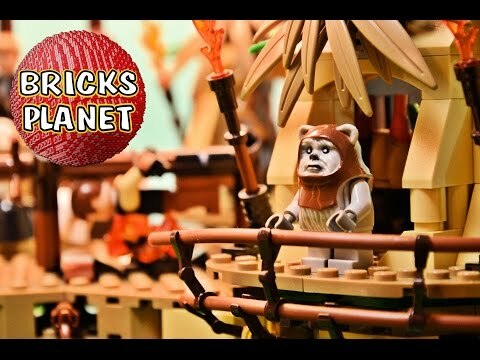 My newest and biggest video is this one with Ewok Village 10236. It was really dificult to find some place for all 17 minifigs and show all interesting parts of this lego set. Tell me what you think about it ? Is here some place to make a short presentation for new members ? Absolutely superb effort - I really enjoyed that! 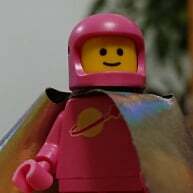 Liked the way you introduced the minifigs as you went along, rather than all at once. Thought the pacing was good - some stop motion films of large sets seem to go on for ages, but you got that just right. The way the figures were involved was great - the ewok walking across the bridge as it was being built, and Han & Chewie being caught in the net as they appeared stood out. But fantastic work - definitely the sort of video that bears repeated watching, although is it really a review if you don't give any opinion? Anyway - I can't begin to imagine how long that took you, but keep up the good work! I think Boo said it all really. 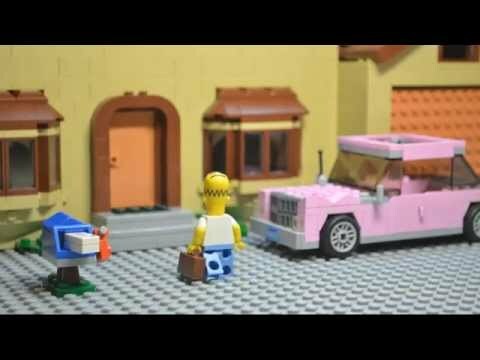 Definitely a nice take on a Lego video, the stop motion was a million times better than anything I would have the patience to do. My only negative criticism would be that the music did my head in, but I appreciate that getting licence free music is difficult so really a very minor point. Thanks a lot. I'm absolutly agree with your opinions! Music is really exhausting, I know that. I tried to find just one music for whole video but now I see it's not good idea. 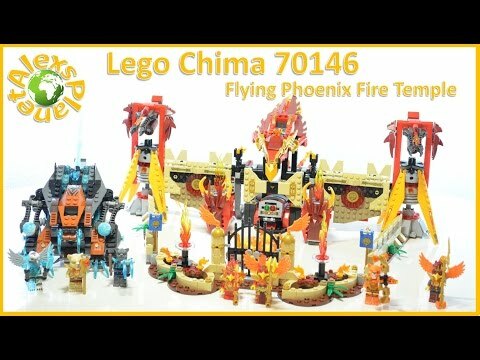 I don't like really give my own opinion because we have all our different opinion and I want just to show how it really is this and others lego sets. 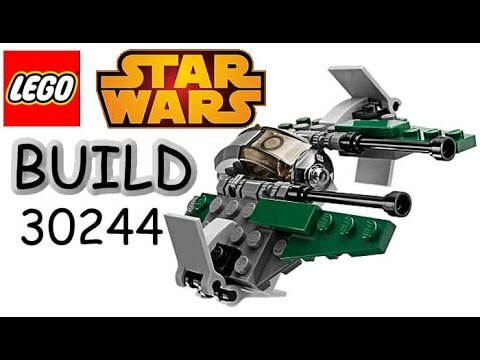 Show the minifigs, construction, moving parts, traps, etc. and basic informations. Fantastic work. I like how you give a little "bounce" to every part as it's added. Really really excellent. I dont watch 'build' videos, like unboxing videos they're of little interest, well no interest to me really - if I wanted to see a build being built I'd do it myself. But you brought this one to life with the minifigures, action and even a little comedy. If anything Id have had the building parts even quicker but even as it was, very good. I didn't even mind the music too much either. Lego must hire you ASAP! This is an extraordinary exceptional video! Bravo! 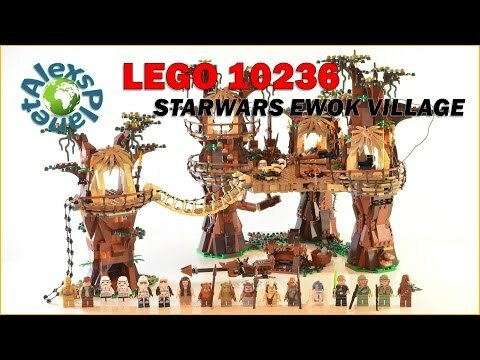 I didn't see your other videos but the Ewok Village looked really good and must have taken a lot of patience. Haha that will be great ! :) Thanks ! I have just started Stop motion Timelapse buildings and short movies. I have made one of each: Timelapse building of Back to the future and a stop motion of Itchy & Scratchy Show intro. 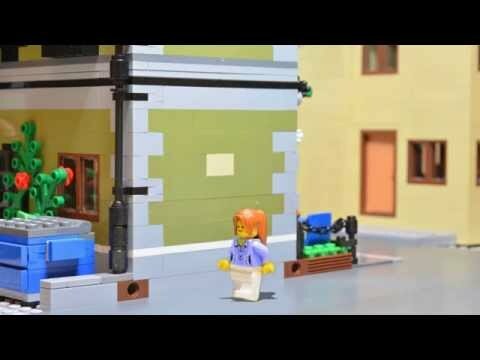 Tommy from BrickNerd.com has just uploaded his latest LEGO stop-motion animation. I thought my fellow Brickset members would also like to enjoy. It's worth watching if you cannot wait for 'Batman V Superman: Dawn of Justice! 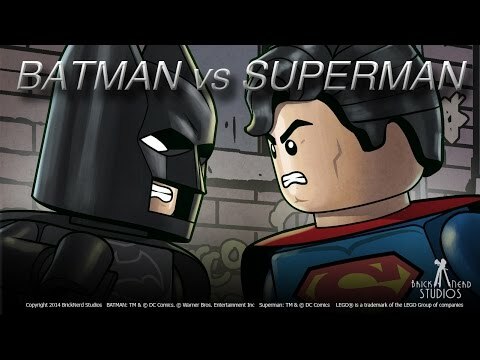 "BrickNerd Studios is extremely happy to announce our latest project is online, Batman Vs Superman. This was a ton of work but also a ton of fun. I'd like to thank everyone that helped make this a reality. Please watch and share!" - Tommy Williamson. You and i are of one mind on this @CapnRex101‌ - as much as I want DoJ to do well and launch a full on DC cinematic universe I can't believe it will be anything more than mediocre. Heres to the Lego Batman movie being awesome and giving us something worthwhile in the DC movie front! 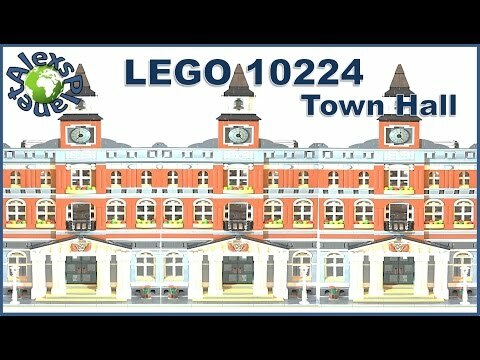 Here is my building review. Enjoy. Yeah...I haven't been able to wrap my mind around WHY Batman would want to fight Superman (and vice versa) in the first place. Smacks of desperation for a story by DC, but hey...I haven't read the story so I don't know personally. It could be great?! They are drawing heavily from The Dark Knight Returns/The Dark Knight Strikes Again by Frank Miller, which is one of several DC story lines that puts Batman against Superman. It's a solid storyline, but it's a standalone storyline, which is set in a different universe to the standard DC storyline, so seems a really bad choice for launching their cinematic universe to me. I simply cannot see the film working on any level. The success of the Avengers franchise is down to the relative lack of film misfires and every franchise like this needs a strong start, which Iron Man was. Man Of Steel of the other hand was awful and pretty much ruined any chance of a Superman/Justice League film being half decent. Films based on a gritty, but not necessarily realistic, version of Batman are DC's only hope for the next five or ten years in my opinion. If Spiderman ends up in an Avengers property, unlikely though it may seem, DC might as well give up altogether. I'm a big fan of the MCU and only have high hopes that DC can be as successful with their Universe being created from MoS onwards. If one is a true comic fan, they wouldn't want to choose one over the other but rather have both be great on their own merits. With MCU going fun and exciting, while the DCU goes realistic, gritty and violent, which is staying true to their comic brand styles. In my humble opinion, the critical beat down MoS has received is not deserved. The main quips are that it was too gritty, too violent with the finale move, Supes was too emo, and the ending was a smash fest of CGI buildings. I would only agree with the gratuitous smash fest part being overly done, while the rest are undeserved criticisms. He knows he's an alien and not like the rest of us, how would you feel as a child growing up like that? Quite depressed, emo, and literally alienated. It's not trying to be the old corny Superman and shouldn't be cornered into that comparison. Have you tried to watch Superman Returns recently? That movie only proves the point that Supes needs to move away from that characterization in order to be taken seriously. The new generation needs a different Superman to relate to, not Christopher Reeves era of Supes (which was great for its time). Plus, Costner made a great Pa Kent and his demise had impact, although too premature imo. Ma Kent was also terrific and was depicted with a strong spirit, which I appreciated for the character. While I was not too impressed by Lois and Perry. Last but not least, Caville makes for an excellent Supes that is to be taken seriously and not a bumbling clown. He is staying true to the New 52 version of the character. But I too have reservations about the catch-up work they are trying to accomplish with DoJ and cramming too much into one movie to act as a big bang catalyst for expanding the roster quickly. My fear is that it will end up like ASM2, which was unwatchable due to the cramming and bypassing of character development. So in all, I still have high hopes with lingering doubts for DoJ. Even though Bats vs Supes should have been held back for a later time, but we'll see how this turns out. As for Spider-man, Sony needs to give it up and let Disney do him justice. And just let the Fantastic 4 die after this terrible attempt at keeping the license. X-men should stay with Fox as they've done well with that property and I appreciate the stylistic difference they've instilled since First Class and DoFP as variety to what Disney would do with it. Just looking forward to expansion of their universe with X-Force and Deadpool one day. As I understand the title is 'Batman V Superman: Dawn of Justice' the 'Batman V Superman' part referrers to a court case scenario. So the first name shows that the first person is the grieving party (e.g. that he/she is the person who is bringing the other person to the case. In other words the first party has a problem has a problem with the second party. So in this case Bruce Wayne has a problem with Clark Kent causing the destruction of Metropolis. Marvel and DC may have blown our minds with there slates however for me 'Batman V Superman: Dawn of Justice' beats all upcoming movies! Man of Steel is my number comic book movie of all time. Just to note Spider-Man is my favorite comic book character. The San Diego Comic Con 2014 teaser for 'Batman V Superman: Dawn of Justice' was ****ing amazing! ^ I struggle to believe that someone could confess to liking Man of Steel, although you are entitled to your opinion. There really was not one thing I liked about it. The plot was nonsensical, the action was totally mishandled for a Superman film and the casting was appalling. I like DC characters better than Marvel and certainly want both companies to produce good films, but the overwhelming popularity of Batman means that he basically has to carry the entire Justice League franchise. He is the most interesting hero, he is faced with the best villains and he best lends himself to a movie. Marvel on the other hand has three or four strong heroic characters so can afford to spread the load across them. ^No Batman Forever but Man Of Steel and Dark Knight Rises are on there. ^ Absolutely. Batman Forever is not pretending to be a particularly serious film and it does its job well. That said, it is by no means a good film, just better than those listed in my opinion. The Dark Knight is among the best super hero films of course so I will assume you were referring to The Dark Knight Rises, in which case it has earned its place on the list as far as I am concerned. Once again the plot makes almost no sense and Bane is handled poorly as a character (though Tom Hardy does his best with the material). Out of interest, how long does a film like that take, both in terms of build / photography and post-processing? This video took me about 84 hours of work. My biggest stop-motion is getting out of the bed in the morning. MoS had glimmers of inspiration (I liked Rusty Crow's Jor-El and the stuff on Krypton) but I just found Caville a bit smarmy as Clark/Superman. He lacked some of the weakness the Reeves brought to the role. That said, he didn't really get to play Clark until right at the end (if you buy into the theory that Clark Kent is the persona Superman hides behind, rather than the other way round) so I guess I'll have to wait until DoJ to see what he does with that. I'm interested to see what Ben Affleck does with Batman, I think he could ultimately be the more interesting character in the film. There's plenty of reasons why Batman would see the need to bring Superman 'under control' (seeing as he leveled a city... and is the earth's greatest weapon of mass destruction...) and Superman obviously being opposed to this. I doubt the film will be one long punch-up. But can see the potential there for conflict. How they shoehorn Wonder Woman and Aquaman into the storyline remains to be seen. I'll be waiting for the first trailer before I decide whether DC have stumbled at the first hurdle. Very well done -- a young Lego fan approves! My son and I watched the video together and enjoyed it. Please don't apologize for your English. 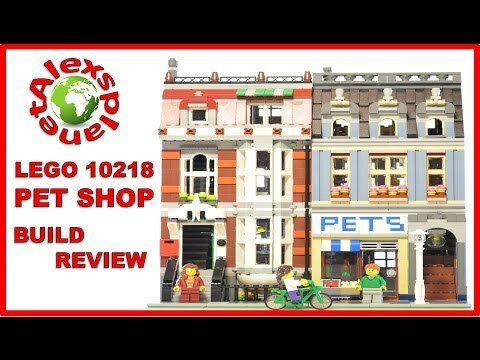 Brickset is an international community and so many of us have accents. I understood you perfectly. Out of curiosity, where are you from? I've enjoyed your other videos, so please keep on sharing. Thanks for comments. 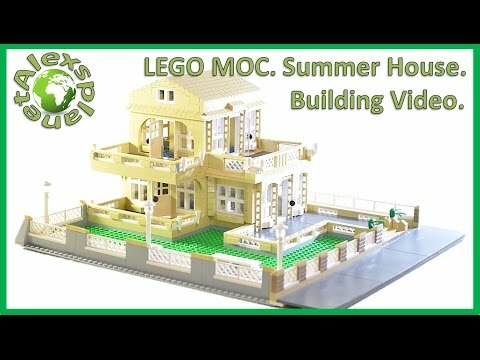 I am from Russia and my native language is Russian, but I tried my best to make it in English so that more people could understand better my first MOC :). This was my first attempt. 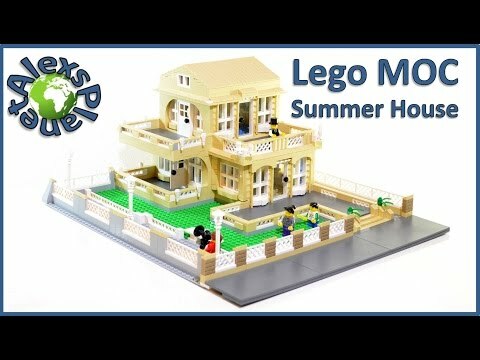 Next I am planning to make a custom big modular house. 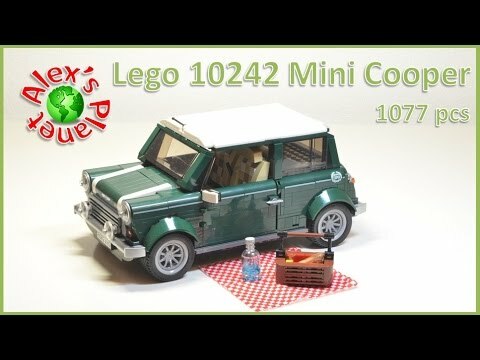 Thanks for the excellent video Alex, the model is great. I like how you have included the 1x4 white fence pieces above the ground floor windows in particular. They fit very nicely with the rest of the architecture. As for your English; it is an awful lot better than my Russian! How do you make the pieces fade in as if they "grow"?